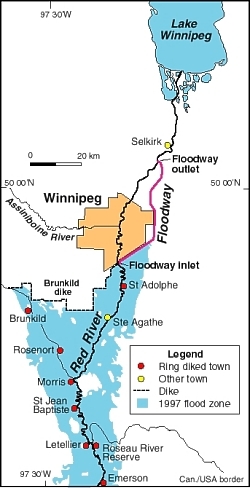 During the 1997 Red River flood, controversy arose over what was understood as then-premier Gary Filmon’s comment that people who choose to live in floodplains must bear some financial responsibility for flood damages. Over a decade later, journalists were still referencing these comments. A sympathetic listener might hear in Filmon’s assertion something akin to the environmental historian’s understanding of flooding as people in the way, as opposed to water out of place. But environmental historians are charged with explaining the collective decisions and social processes that, in addition to individual choices, put lives and livelihoods at risk. People live in Winnipeg in part because the railway runs through it. And with a state penal institution now occupying a former flood refuge, the impetus to develop contemporary means of managing flood risk is surely a community as well as an individual responsibility. 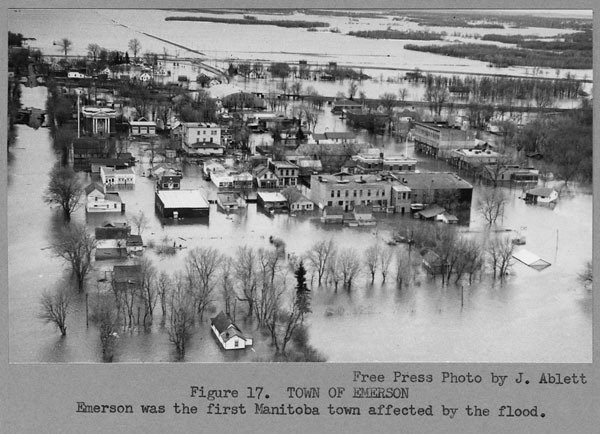 Flooding is Manitoba’s perennial challenge. It is a challenge that is as much human as environmental. It forces us to think hard about what sort of society we want to be, in terms of our relationship to our neighbours as much as our relationship to nonhuman nature. And it offers us the opportunity to deal gently and generously with those who, at least in part because of decades of collective decisions and social processes over which they have had little control, find themselves most vulnerable to high water. J. M. Bumsted, Floods of the Centuries: A History of Flood Disasters in the Red River Valley 1776-1997 (Winnipeg: Great Plains Publications, 1997), 19. Sandford Fleming, Reports on Bridging Red River (Ottawa: n.p., 1879). Available as Canadian Institute for Historical Microreproductions No. 06108. See also Alan Artibise, Winnipeg: A Social History of Urban Growth, 1874-1914 (Montreal: McGill- Queen’s University Press, 1975), 61-76. Journals of the Manitoba Legislative Assembly, 2nd session, 1st Legislature, 1872, 36. Also noted in Edgar Stanford Russenholt, Heart of the Continent, Being the History of Assiniboia (Winnipeg: Macfarlane Communications Services, 1968), 151. Manitoba has five sandbag-making machines, each of which can produce 35,000 sandbags in an eight-hour period. Province of Manitoba, “New Sandbag Machine Stationed in Brandon By Province,” news release, 3 March 2011.